Hey everybody! 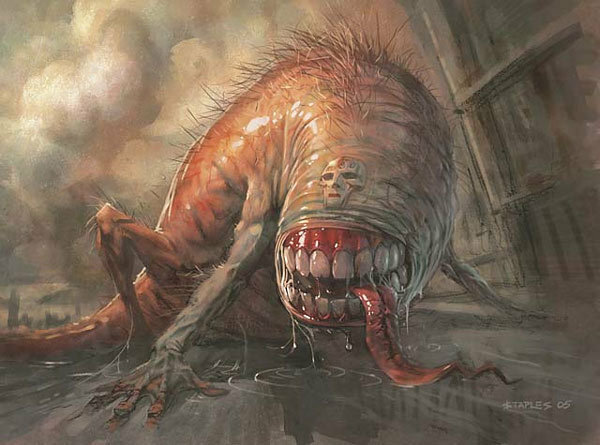 If you’re just joining us, this is the third article in a series about the Nephilim, that cycle of bizarrely-limbed four-color monsters from Ravnica who really ought be legendary. Given that they’re not actually legendary, but are definitely interesting and unique, we’re exercising our house-rule muscles and issuing the decree (with the consent of our gaming compatriots) that henceforth they shall be treated as legendary, with all the rights and responsibilities pursuant to their station. Of course, you may have trouble eliciting that consent, and since no player is an island (except blue mages, and who likes them? ), you’re going to have to give a strong case as to why your unusual choice should be allowed. 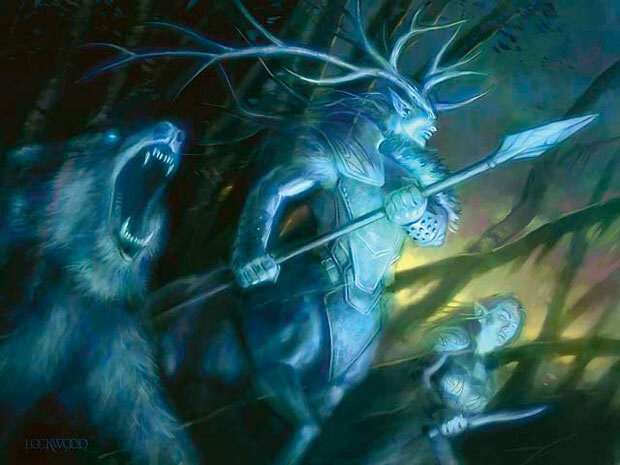 My favored tactic is to impress upon your fellow players how cool the deck is going to be: focus on building an interesting, unique deck, based around your Nephilim’s color identity and flavor (for Vorthos) and/or what it does mechanically (for Melvin). If you can incorporate both and construct your pitch to appeal to your fellow players, you should have relatively little trouble convincing them to let you take your wacky new deck out for a spin. Enter today’s Fallen: the cruel, twisted, and strangely combat-focused Witch-Maw Nephilim. Essentially a mobile mouth, this Nephilim ignores the existence of red, not unlike some EDH players I know. Unfortunately, the absence of red mana does strange and terrible things to a mind: without passion, freedom, and individualism, ideas stagnate, responses are sluggish, and plans seem to progress infinitely without ever really concluding. On the other hand, without red’s focus on doing everything right now, this Nephilim can focus on the future. It crafts its plans carefully, recycling its resources and growing fat on power, preparing the perfect moment in which to strike. When the time is ripe, its opponents will find themselves suddenly ensnared its coils, their usual tricks useless and their demise soon at hand. If you’re really feeling it, give a maniacal laugh (and relish these moments, because really, you’re playing a deck with a bunch of +1/+1 counter creatures, so it won’t happen often). How to represent these twin foci in deck construction? In the future department, we’ll be playing recursion and lots of “growing” cards, while in the restraint department we’ll be adding some specific common-strategy hosers and a series of legendary creature and planeswalker packages. Mechanically, the Witch-Maw Nephilim is all about growth; it starts off tiny but gains +1/+1 whenever you cast spells, becoming a thundering trampler easily capable of one- or two-shotting opponents. While adding Voltron elements could increase your speed in this department, I’ve found that the Nephilim gets the job done just fine all on its lonesome. All you really need to do to pump this guy to magnificent proportions is cast spells early and often. This has the tangential benefit of forwarding two game plans at once, and thus being twice as hard to deal with. Recursion does the lion’s share of making sure we have spells to cast at all points of the game. +1/+1 counters, meanwhile have other uses besides just making things big and smashy, so we’ll explore those avenues as well. On to the deck! 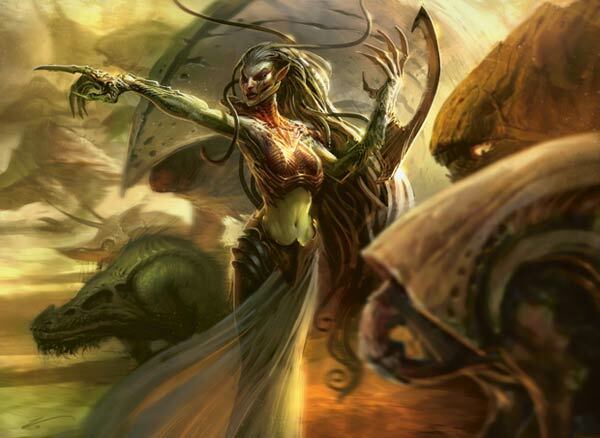 The first subset of cards involves hating on some common strategies; in the absence of red, the Witch-Maw Nephilim cares nothing for your freedom to play your cards. Since the strongest of these hate cards are symmetrical, the deck is constructed in order to minimize their effects on us. After all, it’s fun when your opponents can’t play their game, right?Right. A good number of these cards center around our first legend: Isperia the Inscrutable, sphinx champion of the Azorius guild. Her sneaky spy saboteur trigger helps you figure out what angle your opponent is planning to attack, and if you guess their hand correctly, you’ll even be able to tutor up a solution immediately afterwards. Cheap, efficient, and targeted hosers are often under-appreciated in EDH, primarily because of the variety of decks that show up in any given game and the inherent problems of running potential dead cards in 99 card singleton. Having some information-gathering like Isperia (and knowing your playgroup/common deck archetypes), combined with the variety of tutors in this list allows you to figure out which answers you need and, ideally, the opportunity to get them when you need them. These specific cards all hate on very common strategies, and so hopefully will be relevant in the majority of match-ups, but if something specific is ruining your day or warping your local group, these slots can be customized to take it down. Led by the tag-team duo of Innistrad’s still-living Lunarch Mikaeus and the older, wiser incarnation of Ajani, this section of cards focuses on buffing your team via +1/+1 counters. You could say their efforts are counter-productive. The humble Simic Initiate, while not particularly impressive on his lonesome, makes a fine target for cheap recursion; in order to grow our Nephilim, this deck wants to be casting lots and lots of spells, and a self-sacrificing 1 mana guy with a lasting effect is much better in context than he might initially seem. 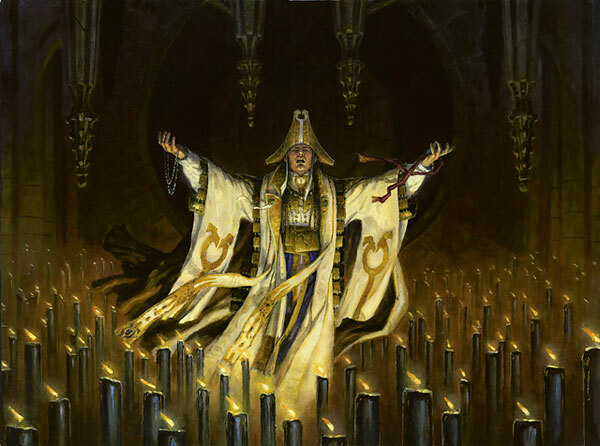 Inexorable Tide, your primary proliferate engine, and Forgotten Ancient also want to see as many spells cast as possible, to further spread around the counter-based lovin’. New favorite Gavony Township makes the cut over more situational brethren Oran-Rief the Vastwood and Novijen, Heart of Progress, but all are potential options. Incidentally, the combination of Cathars’ Crusade and Glen Elendra Archmage can result in table flipping levels of rage, so use it with caution. A side note: all these +1/+1 counters would certainly combine very well with the Persist ability from Shadowmoor block, so why is Glen Elendra Archmage the only persister in the deck? Grafdigger’s Cage is the primary answer: it hoses such a wide number of relevant EDH ‘staples’ that you really want to do your best to have it in play early and often, but it does hose your own persist creatures. One persister with a high amount of utility can make the cut, but a dedicated subtheme probably shouldn’t. One of the simplest ways to ensure that you always have spells to cast is to recur the ones you’ve drawn already. To that end, Karador, Ghost Chieftain is happy to lend his expertise; note that with the exception of Karador himself, all of your recursion functions under Grafdigger’s Cage, which certainly won’t be the case for most opponents. Side note: In this deck, Sun Titan does recur your creatures, but his primary role is keeping your cogs and restrictive pieces in play. Oh, and don’t forget to recover your Grim Harvest! Artifacts are the other simple permanent type to recur; combined with the ridiculous power level on some one- and two-drop artifacts, Glissa and Tezzeret are quite happy to help your Nephilim grow up big and strong. Artificer’s IntuitionThe cog subtheme gives the deck some fun and rarely-seen enablers in Artificer’s Intuition, Auriok Salvagers, and Salvaging Station, as well as an on-theme but non-degenerate home for oft-maligned Academy Ruins. By including a substantial number of cogs, we can play on both axes of general utility, that is, one makes your general better, and the other makes your deck generally better. Okay, no more puns, I promise. In a given game, a large part of this deck’s success is based on its ability to find the right pieces to complement whatever you’ve already drawn or to properly flummox an opponent. To ensure your engines are running at full power, Captain Sisay summons whichever legendary creature you need most. 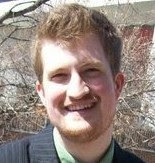 Most of the other tutors are fairly self explanatory. 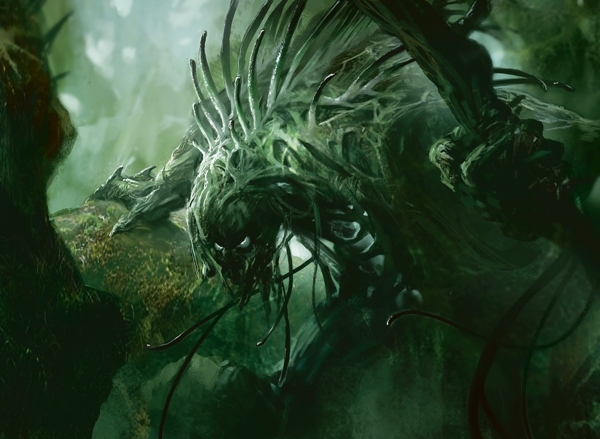 The Survival and flipped!Garruk particularly appreciate getting rid of Genesis, but the recursion suite will typically end up returning whatever you pitch at some point, so don’t worry overmuch about that. The only other thing I have to say here is that Long-Term Plans are absolutely crucial to winning a game of EDH. Crucial, I tell you! The second set of cards provides some drawing and manipulation through small smoothing effects and large shots of card advantage alike. The Top/Future Sight combo in particular can make a VERY large Nephilim in addition to refilling your hand, and this is one of the few decks that can play an Etched Oracle that both survives its card-drawing trigger and also doesn’t particularly care if it’s played with maximizes sunburst. The fair-minded vampiric judge Vish Kal presides over the removal suite in this deck; I think we can all agree that he’s by far the preferable legendary Arbiter to see on the table, even if he is engaged in mauling all your creatures. Most of the removal in this deck is targeted, and in theory single-use only, but these are prime targets for your recursion engines, and will typically come back to wreak havoc over and over again. You only have a very few sweepers, so use them sparingly. Necroplasm and Powder Keg can be tricky cards to get right, but with Hex Parasite and some proliferation, you can take opponents by surprise with a well-timed bait and switch. In a typical game, the Witch-Maw will devour as much mana as you care to provide it, so land ramp and searching, especially in the form of cogs and creatures, helps maximize the deck’s potential every turn. Being both easily tutored and recurred, a given land-searcher is often worth three, four, or more lands over the course of game, so try to maximize it and avoid walking one into graveyard hate. Last, but certainly not least, add a smattering of lands. For this four color lists, try to maximize your chances of getting multiple colors early rather than a bunch of one color; typically, those spells come later on your curve, once you’ve found a land-search card. Some of the nonbasics in this mana base are quite expensive, and while they are all powerful additions to the deck, a workable mana base can be constructed with much cheaper options. The decreased reliance on early-game fixing is just another bonus of running cogs! If you are having trouble with mana, don’t forget the set of artifact lands, which can be found by your artifact tutors. This deck is a blast for fans of incremental value engines and building enormous creatures. It can put together a dozen different engines, and plays differently every time despite its tutors. Try it out, and see if you can’t cover a table in little glass beads! I hope you’ll join me in two weeks, when I get greedy with the Glint-Eye Nephilim. Until then, may you strive for your ideal future! BEHIND THE SCENES BONUS: Here’s the original notes for the first draft of the deck. That draft was really, REALLY terrible. “So what does a restriction of freedom lend itself to mechanically? The prison deck of course. But a typical prison deck is (for most) less than no fun to play or play against, so we’ll be making some modifications. By using mostly tempo-based aggro plan, we hope to win quickly, rather than grind out the game. Actually, when you combine these three elements together, you draw a hand full of do-nothing out-of-order pieces, and if you do manage anything, it’s typically to tick off your opponents by existing.